Microsoft Project® may be used with PD-Trak but is not required. MS Project is an excellent task planning tool for planning activities including task dependencies on complex projects, allowing the critical path to be identified and managed. MS Project can also be used for capturing project resource requirements by task. However, it may be unrealistic to develop a detailed plan with resource requirements for proposed projects during portfolio planning. Further, most companies find the requirements for maintaining detailed Gantt charts with current resource requirements to be too detail-oriented and too demanding. 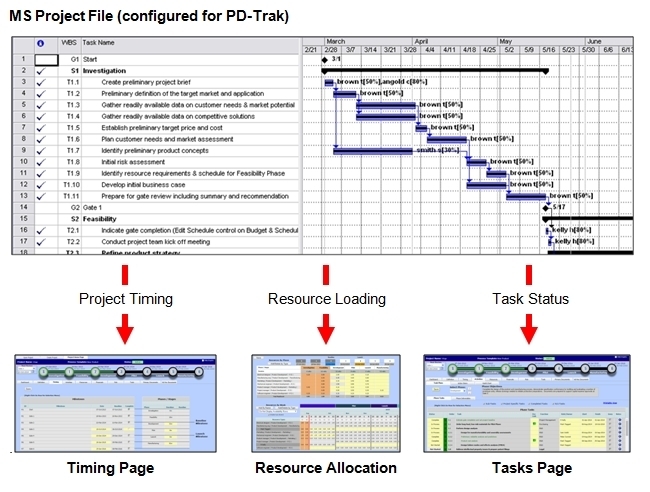 PD-Trak has been designed to work with MS Project for detailed task planning but allowing a top-down planning approach to support early assessment of projects during portfolio planning and to support multi-project resource planning and management.